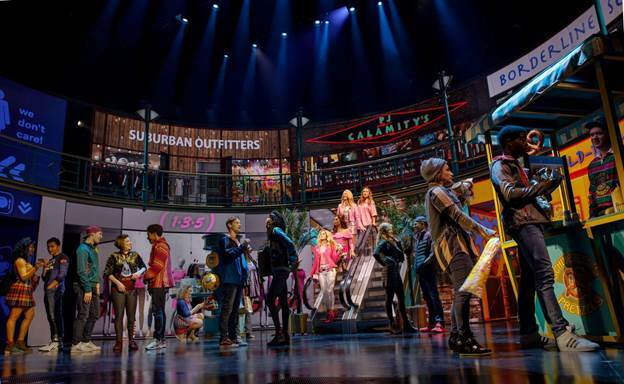 The morphing of the 2004 hit film Mean Girls to a musical is drawing a lot of young millennials to the August Wilson Theatre nowadays. But if you think that only scrub-faced teens are in the audience, think again. This new musical satire is attracting a broad cross-section of theatergoers who want to take a fond look back at the tribal rites of high school. 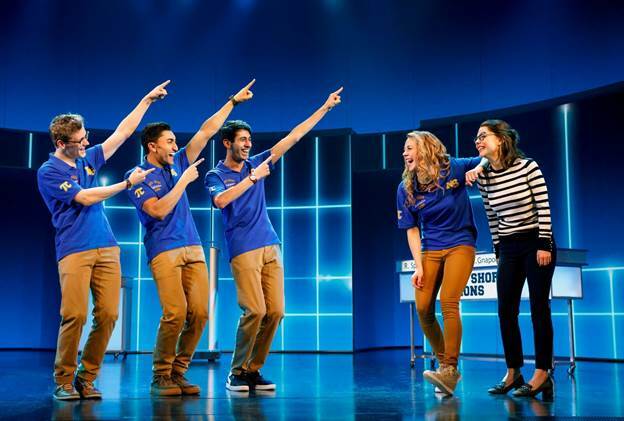 Directed by the Tony award-winning Casey Nicholaw, with a book by Tina Fey, and music and lyrics by Jeff Richmond and Nell Benjamin, respectively, this new musical is carving out its own niche on Broadway. It may not have the splashy numbers that you will find in SpongeBob SquarePants or the fantasy landscapes in Frozen, but it does speak in its own teen idiom and comes complete with an uplifting finale. The scenario: Cady Heron (Erika Henningsen) grew up on an African savanna, but that environment seems tame when compared to the new experiences that await her in suburban Illinois. As a homeschooled teen of traveling zoologist parents, she has never been exposed to a real high school environment. But outsider Cady, who’s whip-smart and pretty, is determined to learn who’s who and what’s what at North Shore High School. Of course, she doesn’t go from being an outsider to an insider over night. There’s the Queen Bee Regina George (Taylor Louderman) and her clique called the Plastics, who she must learn to handle with kid gloves. Much of the story involves, in fact, how Cady deals with these teen-age moguls—and finds out where she fits into the complex world of high school. As a theatrical storyteller, Fey is biting and polished. Fey, who cut her literary teeth by being a headwriter at Saturday Night Live, proves that she can also work on the larger canvas of musical theater. While Mean Girls clearly benefits from her pithy one-liners, she also shows that she can create a story with a dramatic trajectory that can pull an audience in for two and a half hours. The work premiered at the National Theatre in Washington D.C. (running from October 31 to December 3, 2017) and garnered favorable notices. Now that it’s landed in New York, it seems that the out-of-town critics were right on the money: Mean Girls is immensely entertaining--and edifying. For Fey, this is an exercise in adolescent malice with a coda that underscores the importance of compassion and goodwill. No, the finale isn’t altogether convincing. But if this dark-tinged piece ties up its narrative’s loose ends a bit too glibly, it still manages to send out the strong message that back-biting, gossip, and mean-spiritness never win the day. Finn Ross and Adam Young’s video design gets writ large with the Burn Book, a nasty potpourri of lies and gossip that’s meant to deep-six (in the social sense) anybody who appears in its pages. The aptly-named Burn Book burns the reputation of many a character in the story. But whether or not the dirt that is dished here permanently soils anybody’s name is one of the more interesting lessons delivered in the musical. Under Nicholaw’s taut direction, Erika Henningsen plays the part of outsider Cady with great energy and naturalness. Taylor Louderman also distinguishes herself as Regina George who intimidates everybody, including the high school principal Mr. Duvall (Rick Younger). It would be tough to find better supporting actors than Grey Henson and Barrett Wilbert Weed as Cady’s friends, Damian Hubbard and Janis Sarkissian. Damian and Janis might not be squeaky clean in Mean Girls, but they surely teach Cady the ins and outs of high school life. This is a cautionary tale. Fey takes advantage of all the situations that teens can find themselves in as they try to define themselves as young adults. Act 1 focuses on Cady’s baptism of fire into North Shore High School, showing how she edges herself into the Plastics’ clique and gets to know Regina up-close. Act 2 ratchets up the action and shows how calculating teens can be when they want to succeed in a dog-eat-dog environment. But whether it’s at school, the mall, or in the bedroom, all the teens at this fictive high school are faced with high-stake situations that involve their grades, reputation, and sexual identity. It’s unfair to single out any one song from the mix, but the opening number “A Cautionary Tale,” sung by Janis and Damian, gives one a sweeping bird’s-eye view of what’s ahead. Other ear-filling songs are the ensemble number “Meet the Plastics” that introduces us to the envied Plastics’ clique and then the slightly corny but heartening finale “I See Stars,” sung by the full company. Those who are fans of the movie may fault this musical adaptation as being too song-driven. But if the screen version can boast a more air-tight plot sans versifying, the musical adaptation is far more hummable—and right in tune with the Trump era. Mean Girls is for everybody. Teens will like it as a mirror held up to their present-day life. Parents are sure to embrace it for showing what goes on behind classroom doors. School teachers will enjoy it—for depicting teachers as sturdy anchors in the turbulent world of high school. And others will like it simply because it’s a refreshing new look at teens and how they survive—and hopefully thrive—in high school. Running time: 2 hours; 30 minutes with one intermission.